​Sean Monaghan is an undefeated (28-0 17KO) light heavyweight from Long Island who has been waiting for his big shot, for the last few years. He is a staple in the NYC fight scene, bringing a dedicated and raucous crowd wherever and whenever he fights. For a while, Monaghan was thought to have finally gotten his big fight chance against current WBC light heavyweight champion, Adonis Stevenson, until the fight was unexpectedly called off. Monaghan then believed that a fight with fellow Long Island fighter Joe Smith Jr. would come to fruition, until Smith took a better deal on the left coast against Sullivan Barrera. ​Fortunately for Monaghan a big fight came through in the way of undefeated, Staten Island fighter Marcus Browne. The two will battle it out on July 15th, on Fox primetime television and will be part of the first boxing card at the newly renovated Nassau Coliseum. Seanie took some time away from his training schedule to speak with us at Boxing Insider. Boxing Insider: How does it feel to be on the first boxing card at the new Nassau Coliseum? Sean Monaghan: Its beautiful man. I run on Mitchell field, the track is right outside of there. Every Monday and Wednesday morning, I’m doing my laps and I look up at the Coliseum, imagining myself fighting in there. So it’s the perfect fit for me. That’s my home. Boxing Insider: You are going up against someone you know in this fight. Tell us about your relationship with Marcus Browne. Sean Monaghan: Out of all the guys in boxing, he is probably one of my better friends in the boxing game. It is a little unusual for me, I’ve never done this before. We haven’t spoken about it yet, but I’m sure we will be cool when it’s all over. We just have to go do what we gotta do. It’s nothing personal, strictly business. Boxing Insider: Is he someone that you have trained and sparred with before? Sean Monaghan: I’ve sparred with Marcus more times than I can remember, I’ve sparred with Marcus a lot. Boxing Insider: Is this fight “Make or Break” for you? Sean Monaghan: 100%. I feel like, I’m thinking like none of my fights before this even mattered. This is my chance to prove that I’m one of the best fighters in the world. This is going to be a real big win on my resume. Boxing Insider: Talks were out there that you were going to fight Adonis Stevenson or Joe Smith Jr. What happened to those fights? Sean Monaghan: I don’t know what happened with the Adonis thing to be honest with you. I thought it was a go, we trained for five weeks for it and then one day I found out like everybody else. So that sucked. Lou DiBella made me a promise that he would get me a big fight, he gave me his word. They offered me Marcus or this Swedish kid. The money for Marcus was double. I said if I beat this Swedish kid (Erik Skoglund), nobody would care. I knew I would have to fight Marcus, we’ve always known. There were times when you had me, Marcus Browne and Joe Smith all sparring, all doing the round robbing sparring at the same time. We all knew that, sooner or later, we would all have to fight. ​We tried to make a fight with Joe Smith and it just wasn’t the time. His promoter thought they had a better gig somewhere else. So that is on hold for now. It’s a fight that I want and I know personally Joe would do it. It’s just a matter of the promoters getting it together. Boxing Insider: What are your thoughts on the WBC letting a guy like Fonfara getting a crack at Adonis twice, before giving you a shot? 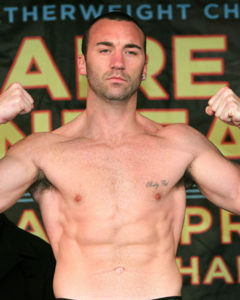 Sean Monaghan: With boxing, Fonfara has been in there with tough guys, but no way does he deserve a shot over me. And as much as I don’t like to say it, Joe Smith really deserved the title fight, he knocked Fonfara out in one round. I mean we’re all here scratching our heads thinking how does this thing happen. I think boxing fans have to take a stand and demand better fights, because these sanctioning bodies work in mysterious ways. I think they are hurting the sport, with whatever private deals they make. Like if you look at the UFC, those guys have to fight a tough guy right away, and if you beat him then you get an even better fight. If you get knocked out you aren’t getting a title fight your next fight, it doesn’t happen like that. I don’t know. I’m just focused on this fight, I was pissed off about the Fonfara thing, but I don’t even care about it anymore, I got bigger fish to fry. Marcus is going to be a very tough fight. Stevenson is a killer puncher with his left hand, but Marcus has a very difficult style to deal with, he’s got power in both hands, he’s slick, he’s fast. These are the kind of fights I’ve been looking for and I’m super excited about it. Boxing Insider: This is a big show, you will be primetime televised on FOX. If you win this fight, you will have a huge audience watching, will you be calling out any names? Sean Monaghan: I still want Adonis Stevenson. I’m not sure if it really matters to call out names at this point. It doesn’t seem to do anything. Right now I’d have to imagine that the winner of this fight would be next in line for a title shot.